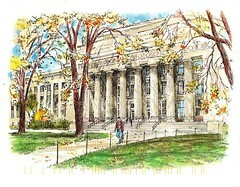 It is a domestic postcard. However, the sender was doing a international travel. 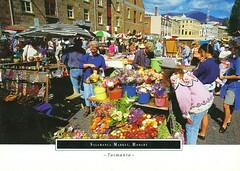 Tasmania is one of the two states I have not been to yet. (another is WA.) But friends told me that is a peaceful place. The size of Tasmania is about two times of Taiwan. But the population is much fewer. No matter how crowded it is, the market is always the busiest place in the 'city'. I sometimes got your postcard from somewhere in the world. Now it is my turn to send you one. 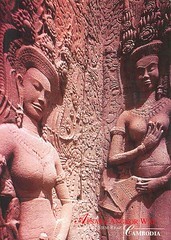 This is goddesses in Angkor Wat. I guess goddesses are welcome in every culture. Good job, Chen. My postcard makes Chen to take his revenge by traveling.